Don’t turn away yet! I know what some of you are thinking. “Pickle onions? Sara who eats pickled onions?” Answer: you do. Or you will. Or you have and you didn’t realize it. These little tart and tangy bites are the secret ingredient in so many restaurant dishes. 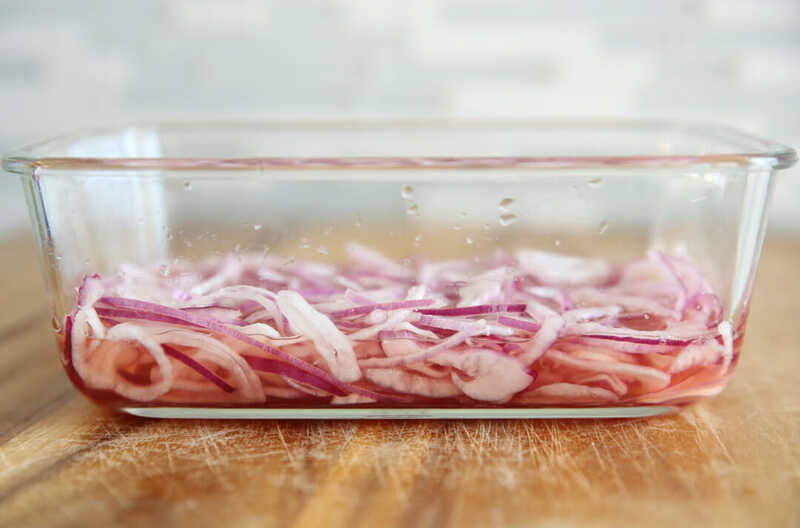 Pickled onions are just onions that have been marinated in a mixture of mostly vinegar, with a little sugar and the option of some additional flavors and spices if you like. 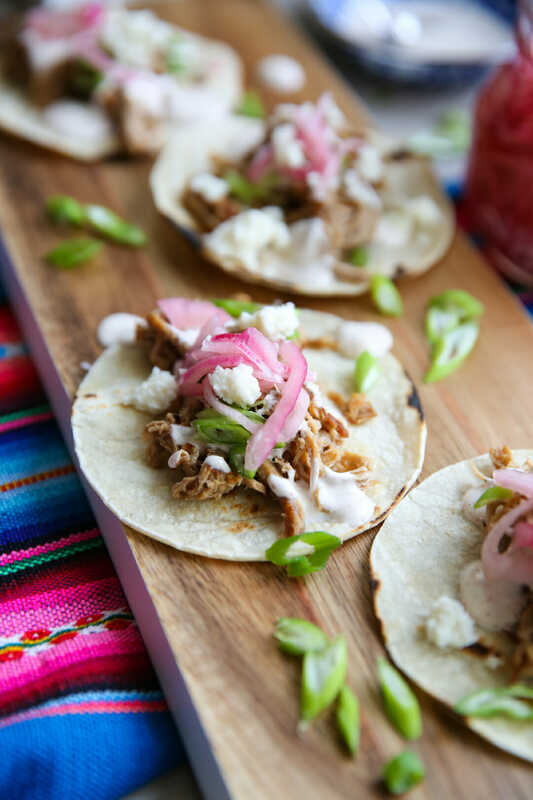 They’re a gorgeous bright pink color so in addition to adding bursts of flavor to every day dishes, they also add a beautiful pop of color! 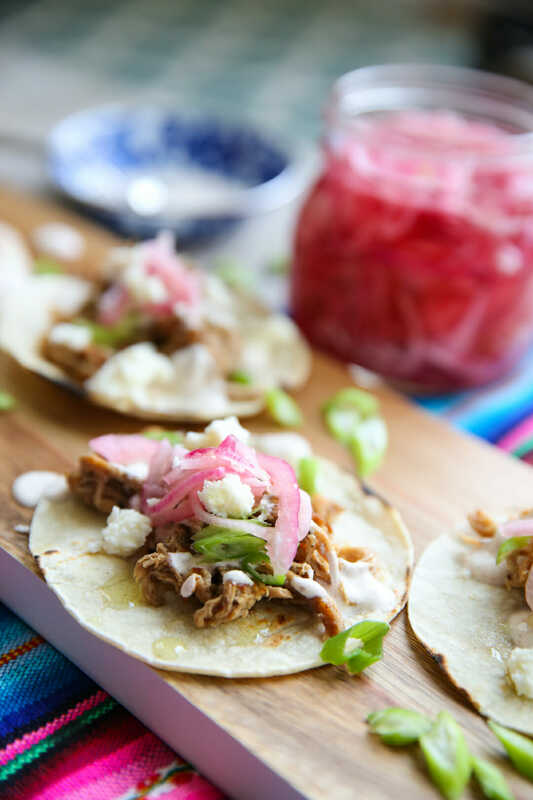 They’re a very common topping on street tacos, and amazingly delicious on things like burgers, salads, sandwiches and even pizza! If you like things like pepperoncinis or these sweet and spicy cucumbers, you’ll love these. Pickled onions are SO easy to make and then they last several weeks in the fridge. I go through phases where I make a batch each week and eat them on tons of different things throughout the week. Let me show you how easy it is to make these. I actually use a shortcut for an already simple recipe! Most recipes for pickled onions will have you combine boiling water with sugar and vinegar, or at least par-cook your onions. I literally just combine vinegar, a little water, and a little sugar, and stir them up with sliced onions. Couldn’t be easier! So first up- onions. 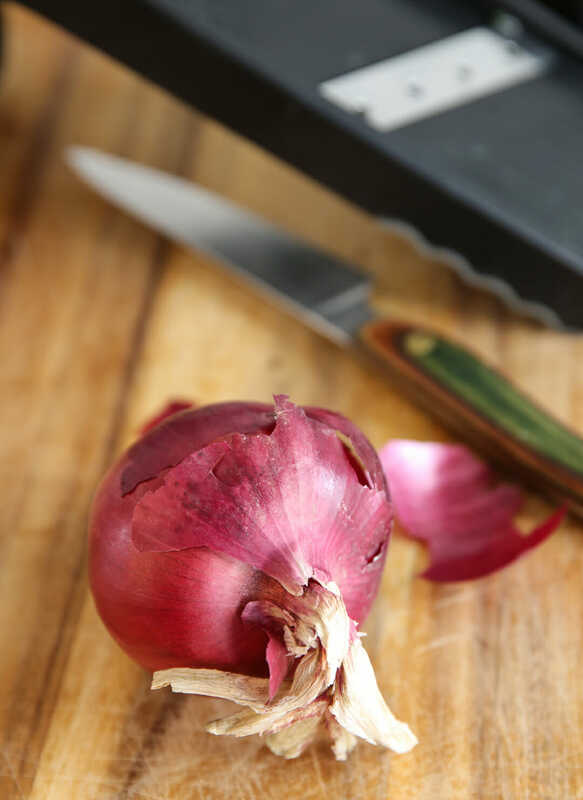 Red onions are what are traditionally used, and they will create that beautiful color, but any variety of onion will work just fine. You can cut them thicker, or thinner. I tend to like mine paper thin so I use a mandolin to slice them evenly. Feel free to cut them up to a quarter inch thick if you like. Next important ingredient is vinegar. 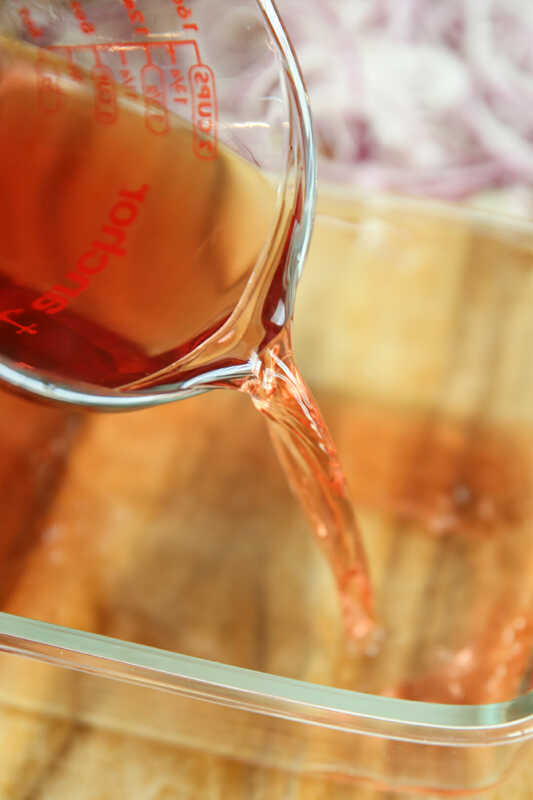 You can experiment with different vinegars for different flavors, the only one I would avoid is regular white vinegar. 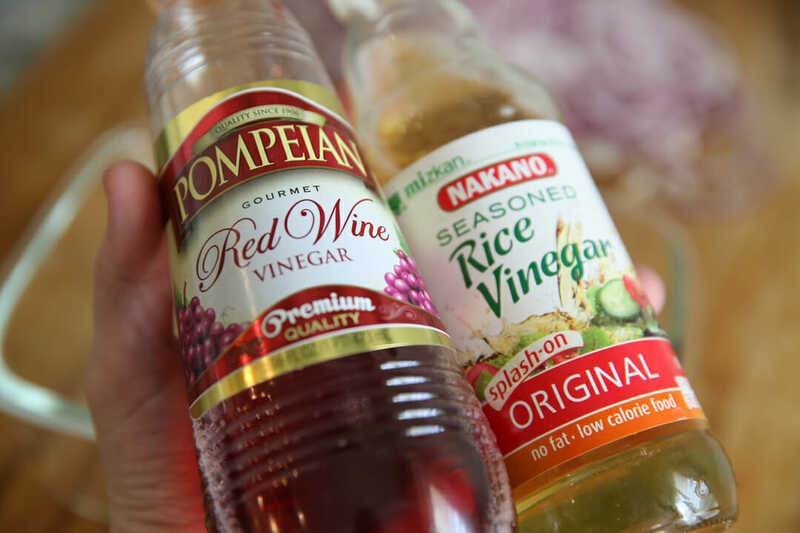 My favorite combo is a mixture of both red wine vinegar (for flavor and also that red color) and rice vinegar, for sweetness. When it comes to sugar, many recipes only call for a teaspoon or so per cup of vinegar, but I like much more than that. Keep in mind your’e not going to be eating all of this sugar. A very small amount goes into the actual onions so don’t be afraid to sweeten them up if you like it sweeter, like me. I use about 1-2 tablespoons in this recipe, but you are welcome to start with less. I’ve also had success using sugar substitutes like splenda and truvia. If you do that, I’d suggest going by taste. Just a simple finger dip will do- don’t try and drink this stuff! ha. Now, that’s all there really is to making pickled onions. Most of the time I keep it that simple. Takes 5 minutes or less to make! However if you’d like to add any other flavor components you can at this point. 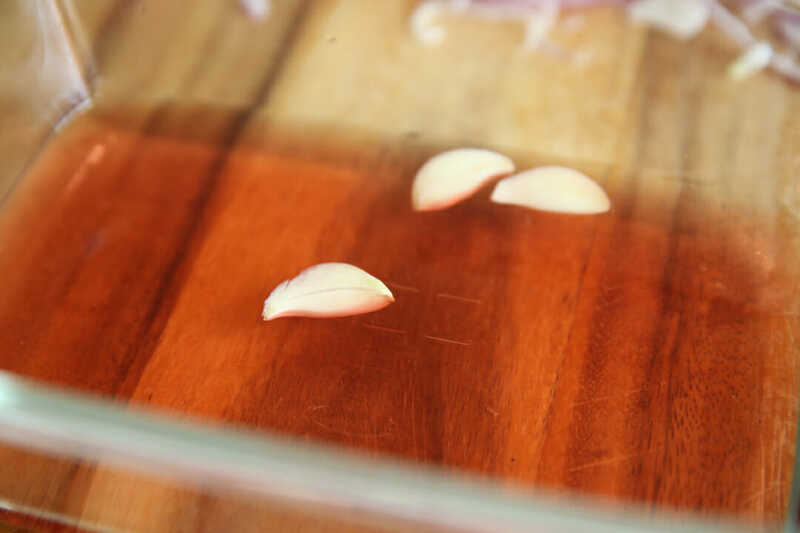 I will sometimes take a clove of garlic and slice it in half or thirds and toss it in there. You could also throw in some herb sprigs or peppercorns or allspice berries. But like I said, I usually keep mine simple! Just add your onions to this mixture, and it’s okay if they’re not all covered by liquid at first. As you stir and as they sit, they onions will become tender and fall into the liquid. You’ll want to store them in a glass container because vinegar can react with metal and plastics can really absorb the strong flavors. Canning jars work great, or these containers by Oxo are my absolute favorites for so many things! They need to sit for at least 10-15 minutes, but they get better the longer they marinate so feel free to eat them over the course of the next couple weeks after. We ate this particular batch on street tacos, my fave! I just use the mini street taco tortillas and layered with Kalua Pork (which I actually made with Pork Tenderloin to make them lighter), cotija cheese, green onions (which seems redundant, but honestly I just wanted something green and I was out of cilantro) pickled onions, and then I used the sauce from this recipe and watered it down to a drizzling consistency. I also drizzled with just a tiny drizzle of Lime Extra Virgin Olive Oil from our Shop. They were so good, and those onions add the perfect tangy bite. I’ll also put these on pizza this week, sandwiches, and even omelets! Whip up a batch today and let me know what you toss them on! 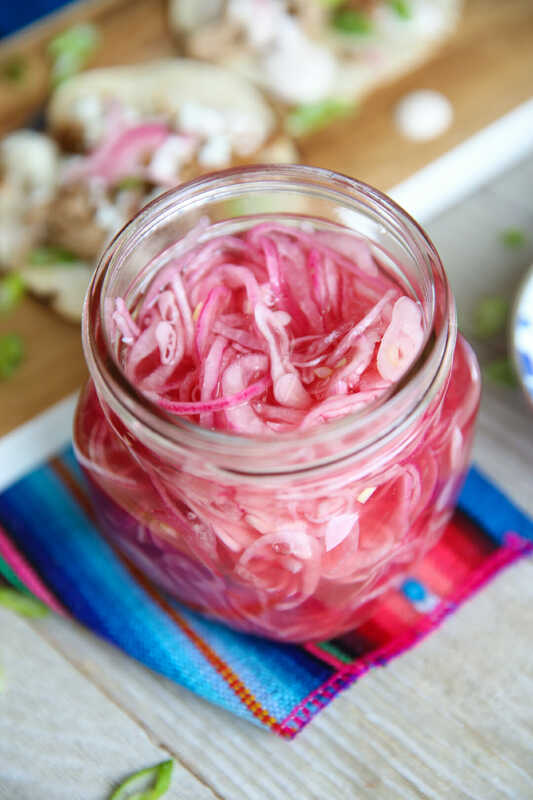 Tangy and sweet, pickled onions add a burst of both color and flavor to so many dishes! Try them on tacos, burgers, salads, pizza, and more! 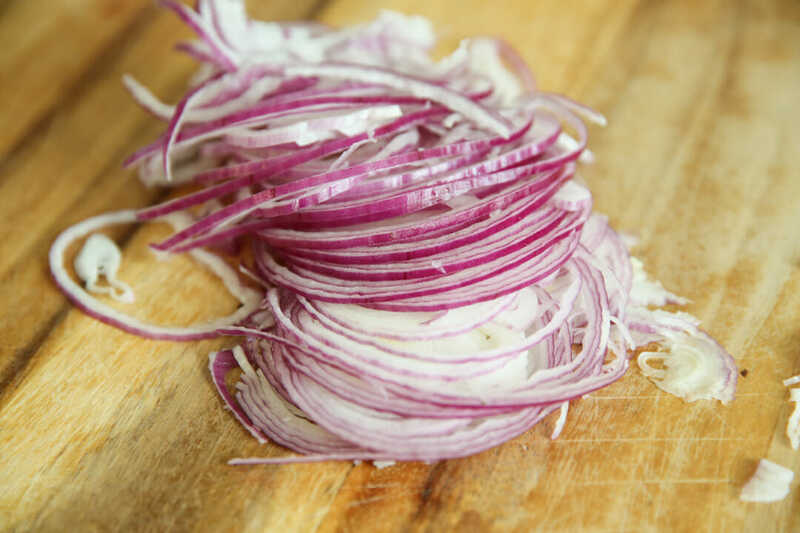 Peel onion and slice in thin slices or half-moons (1/4″ thick at the largest and and thin as a thin mandolin slice). Set aside. Add onions and let sit a minimum of 10 minutes and up to a couple weeks. Store in fridge. I had pickled onions with bbq sandwiches and it blew my mind how good it was. 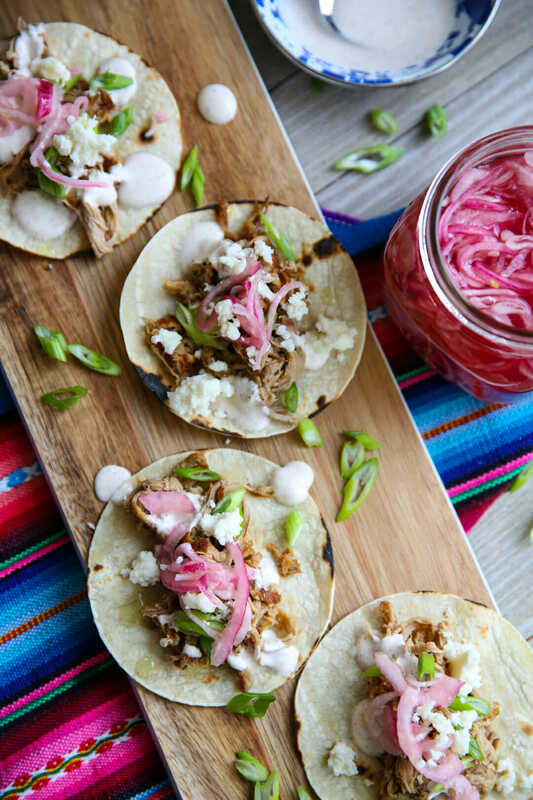 So excited to make these and those street tacos are looking really good to go with them too. Yes! SO good on bbq! Oh my goodness! They have these at Panera and I absolutely LOVE them on every salad! I was just thinking — I need to figure out how to make these bad boys! Thank you so much for figuring it out for me! We have a ton of red onions to use up right now! Totally making these! Do the onion soften a bit some over time? I don’t love the raw, super crunchy texture, and was thinking maybe I could bring them to a boil them stash in the fridge. 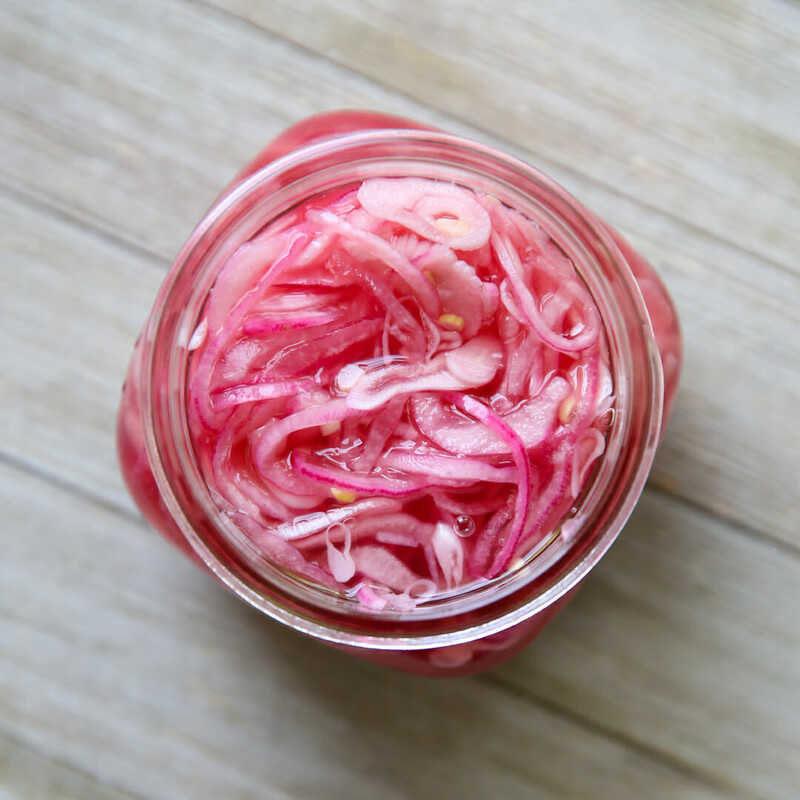 So I LOVE sweet, tangy relishes (we call many versions “chow chow” here in the Deep South) and wanted to make these pickled onions, but as a sweet pickled version. Upped the sugar (you don’t even want to know…) and they are DELICIOUS. Ate them with my sandwich tonight. Thanks for the inspiration…these will definitely be added into our rotation! If we’re talking about secrets, I totally put way more sugar in mine too, but I kept the recipe at a minimum at a fear of being judged haha!